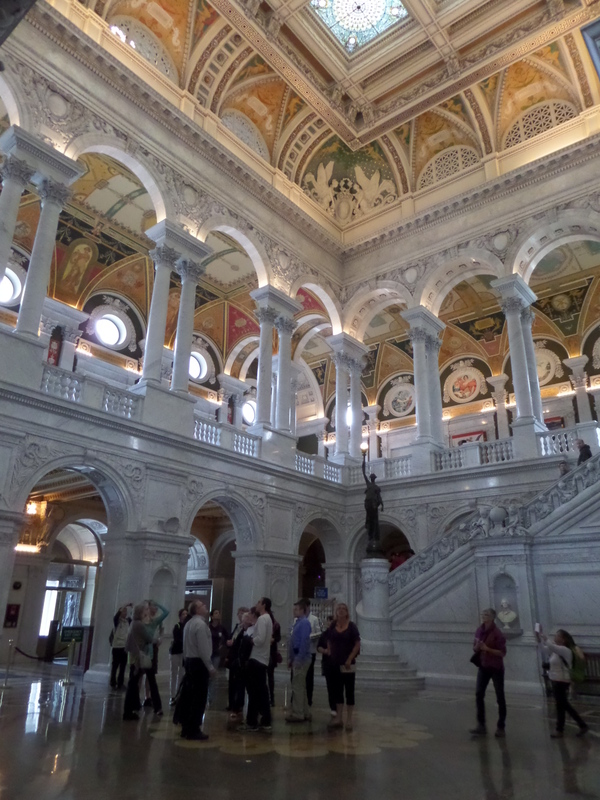 This week I had the opportunity to visit the Library of Congress in Washington, DC. 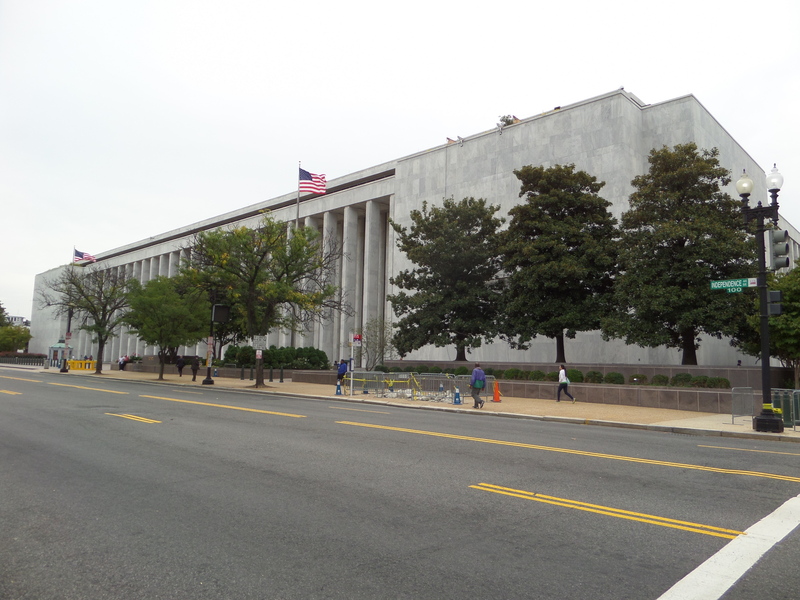 The massive library consists of three buildings: the Jefferson Building, the Adams Building, and the Madison Building. I took the Metro to the Capital South stop on the Blue Line. It was only about 2 blocks up from there. Parking, and even driving, looked completely impossible – the local streets seemed closed off, with police at every intersection. That looked like a permanent state of affairs to me, but I could be wrong. The Jefferson Building of the Library of Congress, across from the Capital building. I wanted to visit the stunning Jefferson Building, and then get a research card and look at a manuscript in the Madison Building. I had a backup plan if there was more time – a list of books I had found in the online card catalog, saved, emailed to myself, and printed. 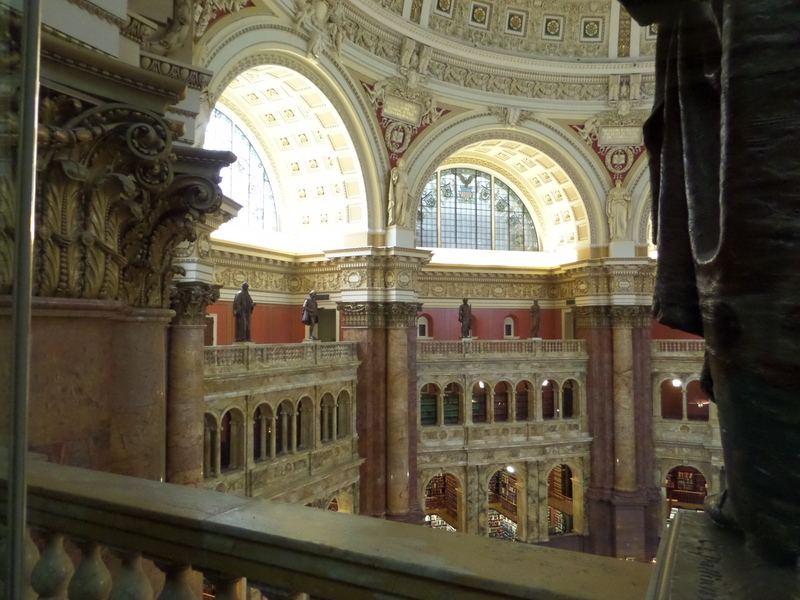 Books from the stacks at the Library of Congress must be requested; one cannot roam the stacks. 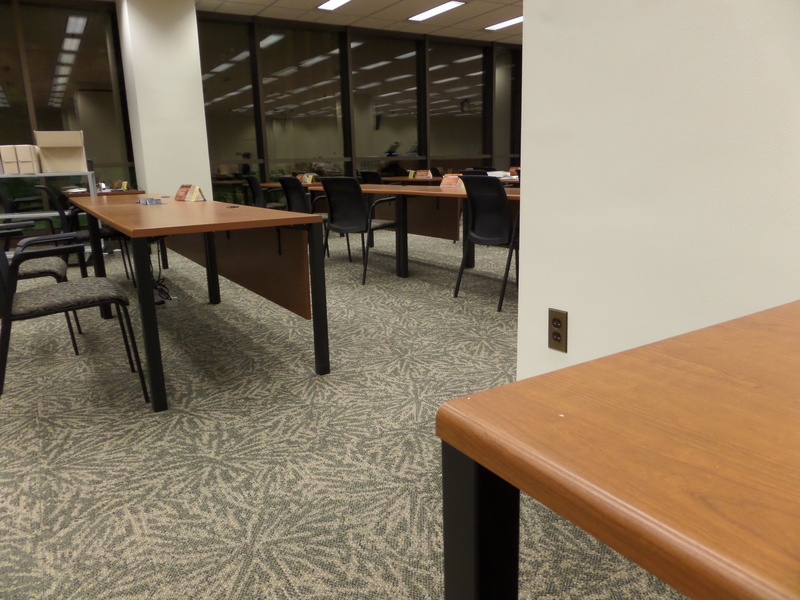 The old Genealogy Room is now gone; users should request the materials from the Main Reading Room. This isn’t my favorite way of doing things, so I thought I would prefer to go for a manuscript. 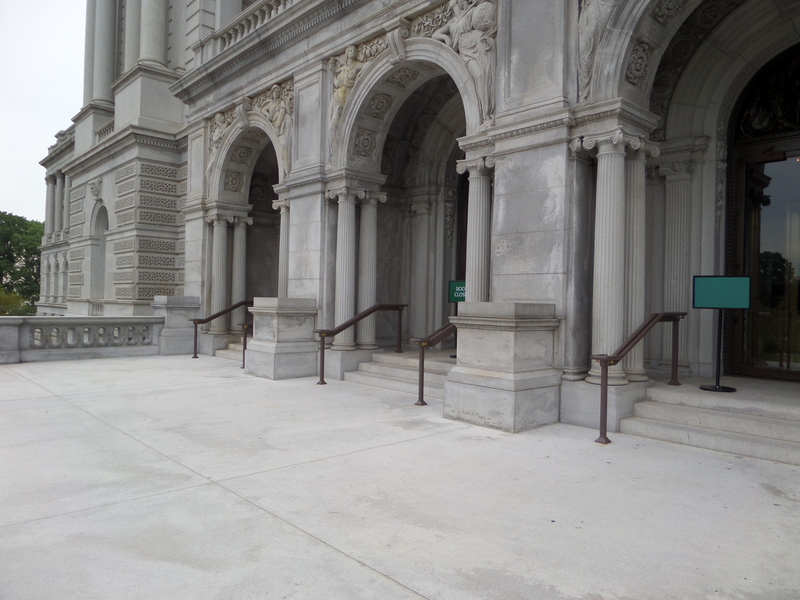 Main entrance of the Jefferson Building. The exit is in the back. The Jefferson Building with its famous Main Reading Room is incredibly beautiful. I don’t know when I’ve been so overwhelmed by a building. It was inspiring, and deserved a longer visit. I hung by some of the tours, listening in. I’ll have to take one of those someday. The Jefferson Building. The main entryway is several stories tall with marble staircases. I walked through the Jefferson Building, visited the gift shop on my way out and purchased a sale book of old Massachusetts maps for $12, and then walked across the street to the more modern Madison Building. 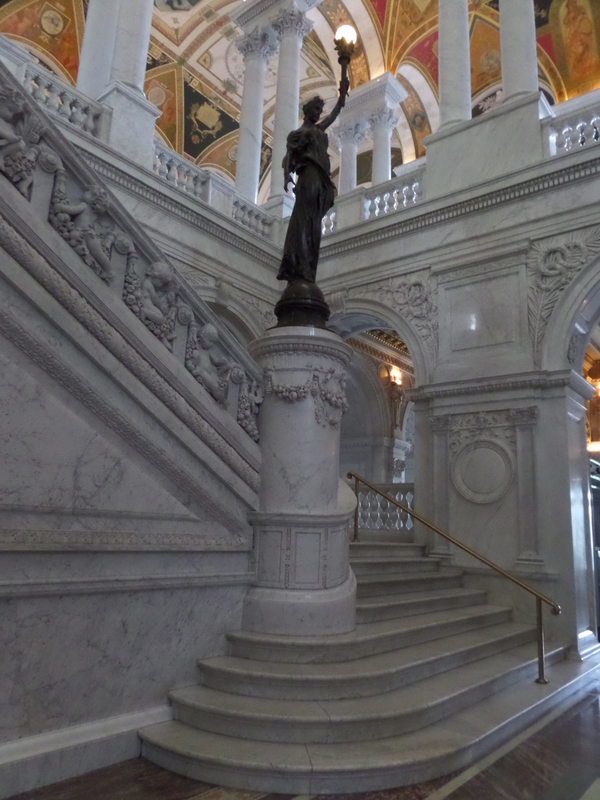 A closer view of one of the marble staircases in the Jefferson Building. I visited the Reader’s Registration office in the Madison Building (LM-140) to request my registration card. I had previously registered online for the card through the link on this page which was not really necessary but I hoped it would speed things up on site. The card was cute. It will be good for two years. Then, I went up to the sixth floor (yellow/red sections of the huge building) and found, with some difficulty, the cafeteria. I had lunch, and it was quite peaceful in there until right about 12, when it got very busy. Some details of the Main Reading Room. I could have gained access once I had my research card, but didn’t have enough time. I went to the Manuscripts Room on the first floor of the Madison Building. There were lockers, and very little could be brought in, but my tablet was ok, and they had wifi, which was helpful. I also brought my camera in to take pictures of the documents. I stored my other gear in the locker they gave me. I had previously dropped them an email to inquire if the manuscript set I wanted had to be pre-ordered for remote retrieval. They said that it should be available without advance planning. Creator Rhode Island. General Assembly. Summary Minutes, acts, and proceedings of Rhode Island’s colonial legislature sitting in various towns. 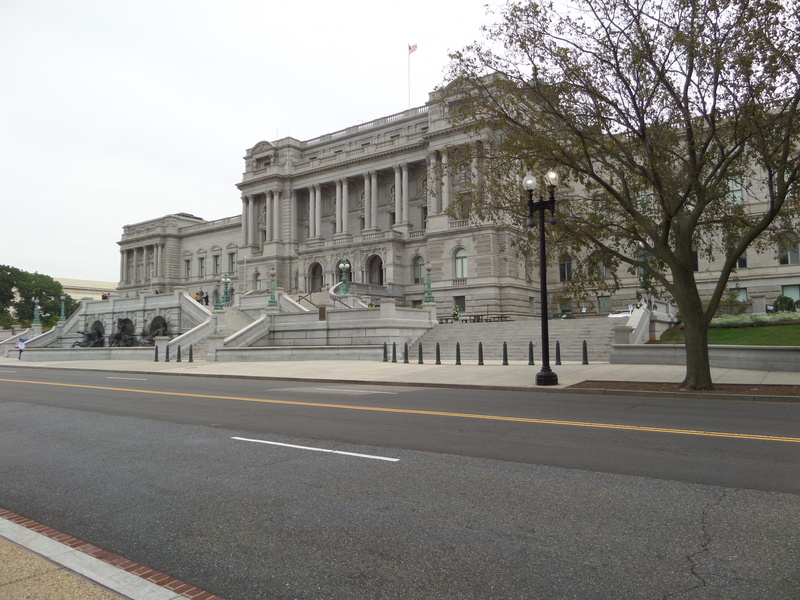 The Madison Building, Library of Congress. 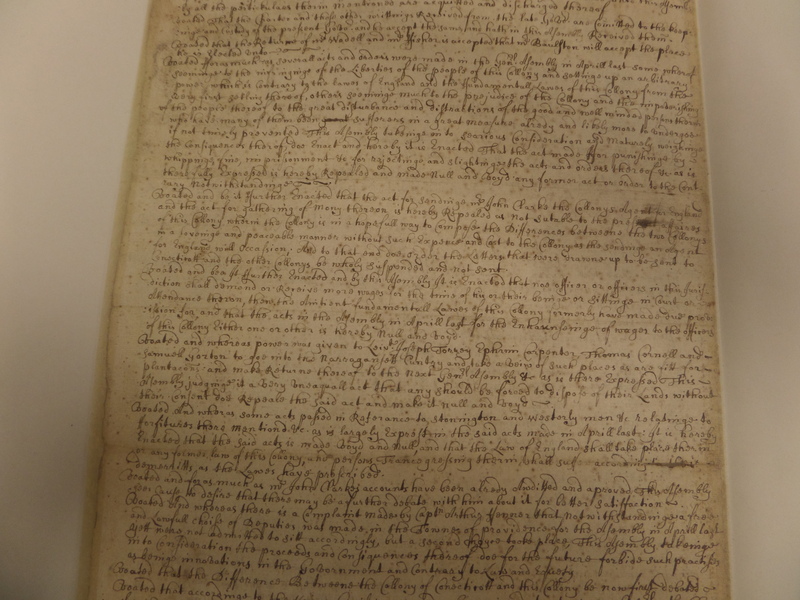 A sample page of the manuscript of Rhode Island General Assembly records. The writing is fairly uniform within each section, and VERY small, to save paper, I presume. A General Assembly act to lessen a criminal sentence he received, in 1679. At the manuscript reading area in the Madison Building. [Volume 2, unpaginated: At a Genl Assembly held for the Collony at Newport the 29th of October 1679] Voted Upon the petition of John Mackandrews, alias Andrews to this Genl Assembly that they would be pleased to remit the sentence of the Genl Court of Tryalls against him, the Reasons contained in the said petition, Being the Great infirmity of his Body the Great infirmity of his Body [<–good sign that this was a copy] and the smallness of his Estate which said Reasons being to us made apparent, and alsoe there being no Evidence against him but the womans accusation and his incapassety to maintain his family, Upon the consideration thereof this Assembly doe remitt, and take off the Corporal punishment due to him the said John Mackandrew by the law of this Collony, and alsoe five pounds of the pecunery [muled?] or fine due by the law aforesaid: And alsoe this Assembly doe hereby further order that the Recorder shall grant forth Execution for the Remainder of the fine due by the law, until the Genl Assembly give order for it : Hoping that this our Clemency and good will, will not in any Wise encourage him nor any others to offend against law in the like manner. No complete or well researched work has been done on John Andrews and I would like to solve the mystery of his arrival in Rhode Island, possibly from Scotland, his whereabouts before his arrival in North Kingstown, and of his marriage(s) and children. Most of what I looked at should be contained in the printed books “The Records of the Colony of Rhode Island” but apparently I had missed some of the John Andrews items previously. 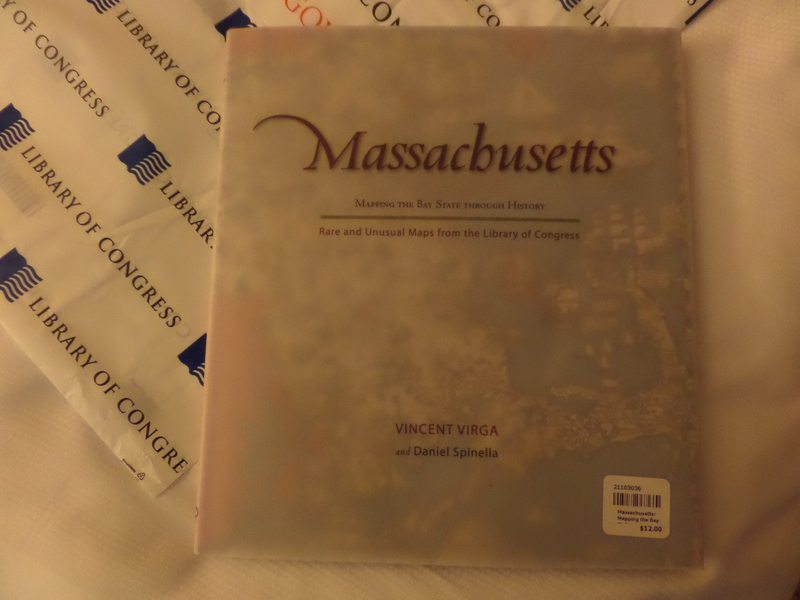 I enjoyed perusing the 6 volumes/boxes, I was excited to find my item as it was originally written (or at least copied), and I am newly dedicated to using the Records of the Colony of Rhode Island. Any time I see a reference to an act by the government, I am going to check out the record myself and not rely on someone else’s summary. I will have to save the list of books to be pulled from the stacks for another trip. But I enjoyed my visit to the library and I would love to go back. 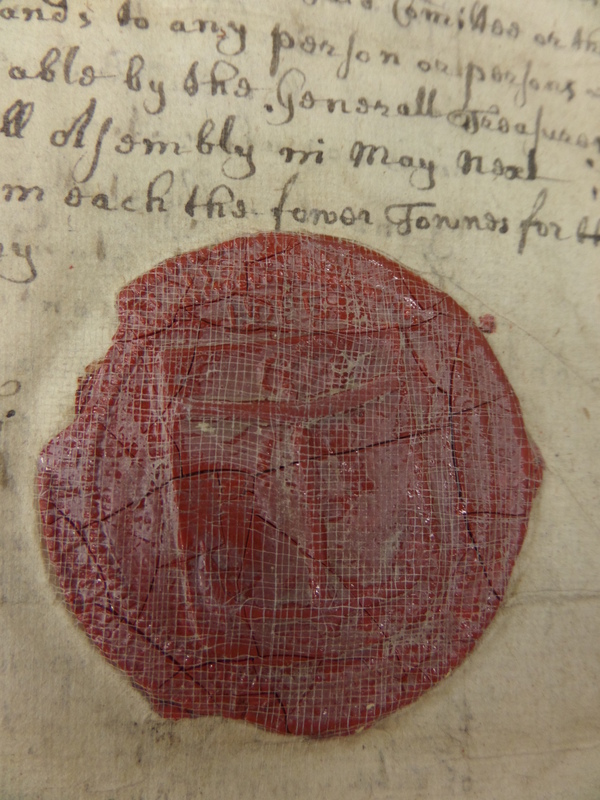 This early seal with an anchor (from a restored, bound page) was evidently meant to mark this as an official copy. It appears many times in the volumes.